Sometimes, despite our best efforts, we get to the end of the semester and we’re stressing out. If you’re asking yourself “What do I need on the final?”, then let me help you out! This Automatic Final Grade Calculator will show you the entire range of possible grades you can get in your class depending on how well you do on your final exam. 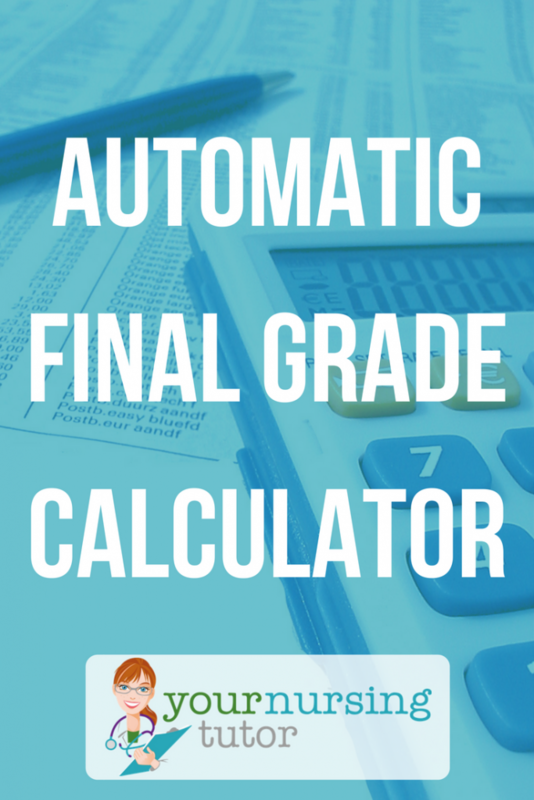 So gather your grades and grab your syllabus, here’s the Automatic Final Grade Calculator! 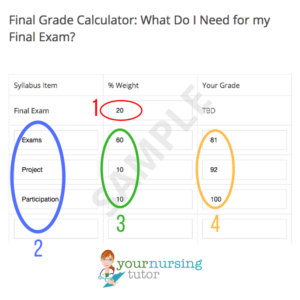 Final Grade Calculator: What Do I Need for my Final Exam? Enter the WEIGHT of your final exam in the box label “1” in the picture. This percentage is how much your final exam counts towards your final grade. It should be listed on your syllabus. Under the “Syllabus Item” column, enter the name of your assignment. It doesn’t really matter what you enter here, just make sure you enter something so that you can keep track of which grade goes with which assignment. 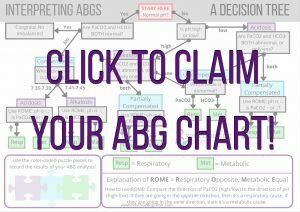 Start entering the weighted percentage of each assignment/exam in the column “% Weight“. You should be able to find this information in your syllabus. If your individual tests and assignments are not weighted, then see the NOTE in Step 1 (but remember, that is a RARE situation in nursing school). Enter the actual grades that you received in the “Your Grade” column. Make sure you enter them as percentages, not as decimals. So if you received a 92% on your group project, enter that as “92”. What do do if you have multiple grades for a single category? If you have multiple grades for a single category, you’ll need to calculate the average grade first. For example, let’s pretend you you have 3 exam scores of 73%, 70%, and 100%. First you need to add them together (73% + 70% + 100% = 243%). Next, divide that sum by the number of grades you added (243% / 3 = 81%). So you would put “81” as the grade for your semester exams. After you submit your grade info, you will see a chart with a list of possible final grades you could earn depending on what score you achieve on you final exam. Here’s an explanation of how to interpret your chart, and what each section can tell you. This first section is a summary of the info you entered. Double check to make sure that you correctly typed the weights of each grade (that’s the percentages in parentheses) and your earned grades. 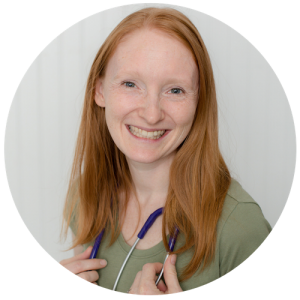 The results will only be as accurate as the data you entered! 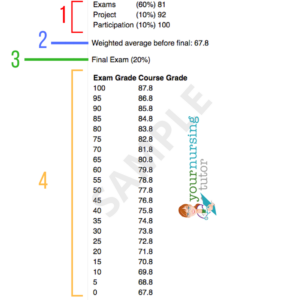 The “weighted average before final” is what your current total grade percentage is without taking your final exam into account. So don’t automatically freak out if it looks low, because it’s supposed to 😉 It will never be higher than the sum of the grade weights that you entered for your other assignments. So for this example, the max weighted average you could even have would be 80 because 60%+10%+10%=80%. Note: If you want to estimate what your current class grade is WITHOUT the final exam, then you can divide your “weighted average before final” by the max weighted average before the final exam. In this example, that would look like: 67.8% / 80% = 84.75%. So that would be my current class grade before I take my final exam. This is just a reminder to let you know how much weight your final exam is worth towards your final grade. Double check to make sure you entered it correctly. This is what you probably came here for…what do you need on your final exam in order to pass your class?? The left column is your potential final exam grades, from 100% down to 0%. The right column tells you the Final Course Grade that you will earn if you achieve the final exam grade next to it. So if your goal is to pass your class, and you need a total class grade of 78% to pass (that was the passing line in my nursing school! ), then you would look in the right-hand column for the first number that is above 78%. Then slide over to the left column to see what final exam grade you need to earn that score. For this example, I see 78.8% in the right-hand column. When I look at the final exam grade in the left column, I see that I would need to achieve a 55% on my final exam in order to earn a 78.8% for my final grade. Not too shabby!